Lush and leafy fresh basil is a wonderfully aromatic herb, and this basil recipe collection showcases fantastic array of dishes and flavour combinations. 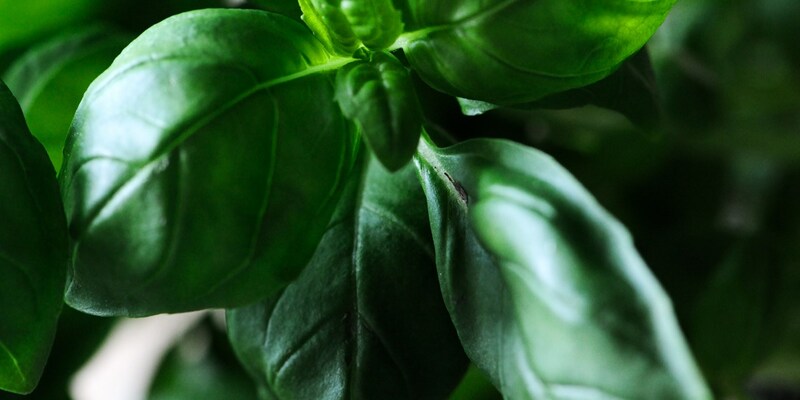 Used a lot, but not solely, in Mediterranean cooking, there are sweet basil, peppery Greek basil, mild purple basil, and stronger Thai basil varieties. Delicate basil leaves are best used raw, or added just at the end of cooking to maximise their flavour, as Tom Aikens’ does in his basil polenta recipe. Continuing on the Italian theme, it acts as the base of traditional pesto recipes such as Adam Gray’s basil and parsley pesto, or is often added to pasta, as Galton Blackiston does with his buttered basil linguine with tomato sauce. Basil and tomato are a perfect pairing, as illustrated by Frances Atkins’ elegant starter of a tomato and basil press. Not only limited to savoury dishes, basil can complement sweet dishes, such as the fresh basil sorbet Matthew Tomkinson uses to top his gorgeous lemon meringue pie recipe.